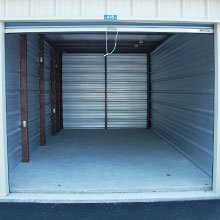 We at Richmond Hill Lock-N-Store provide our customers with a one-stop-storage for all their storage needs. After all, your convenience is our top priority as we do our best to meet the specific demands of every customer that comes to our property. All of our rentals have roll-up doors and you can add to that safety by using your own cylinder lock as well. We are at your service 24/7, so you can access your storage rental whenever you want. Our storage has been designed and constructed in multiple sizes to accommodate both large and small items, as per the needs of our customers. We have surveillance cameras to ensure that everything within our facility perimeter is under our watch. Long and robust fences ensure against trespassing. Richmond Hill Lock-N-Store has been constructed with wide avenues to allow easy access for multiple vehicles, large and small, for easy entry and exit. We are a locally owned and run business that is located at Richmond Hill’s busiest road. So give us a visit and allow us to protect your belongings in safe storage!